"Perhaps you can help me. Any idea where the antimatter lab is?" This episode was freaking nuts. And by that, I don't mean to imply that plot crap flew in out of nowhere. Everything that happened was very carefully set up at the beginning of the season as well as the beginning of the series. Don't you love it when that happens? As everything geared up to Alec making that time jump, we revisited the original time jump in 2077 -- but this time, with a lot more background and context. The SadTech antimatter engineer who was killed in the previous episode's flashforward was taken out by a minion of the Elder Alec because she had been approached by Freelancers. So the Elder Alec wiped Kiera's memory of the murder and the Grapefruit, and he deliberately sent her to the past with Liber8, which we pretty much already knew. Kiera's husband Greg betrayed her, although I'll give him the tiniest bit of credit for asking that Elder Alec keep Kiera away from the execution. Which he most certainly did not. As the Elder Alec was talking to Jason about the dogmatic Freelancers, I was going, wow! Jason works for the Elder Alec! How Kyle Reese of him... and then it hit me, before the reveal, that Jason had to be Alec's son. It seems pretty clear to me that the Elder Alec decided to send Jason back in time not just because of the Freelancer problem, but because it was the only way Alec could protect Jason's very existence from the changes Alec wanted to make in the timeline. Of course. Meanwhile, in the present day and on the 34th floor at Piron, Escher revealed to young Alec that he was Alec's father. Recruited by the Freelancers when he was a teenager, Escher/Mark Sadler "died in a fire" in order to protect Ann and Alec, but now he's ready to send Kiera to right before the 2077 execution and keep Liber8 from making the trip to the past in the first place. I think. I thought it was a bit sad that after being so close for so long, Kiera and Alec were at cross purposes and kept lying to each other during this episode. Alec was planning all along to go back in time and save Emily, while Kiera was ready to deceive Alec because she knew that this was her first real chance to return to her own time. Alec was nattering on about what might happen if Kiera returned to before the execution. Would there be two of her? Would the space-time continuum erase her from existence? Hey, we still don't know if the future can be changed, do we? The reveal that the Freelancers are time cops was one of those "of course!" things. It makes perfect sense. And they even have a time travel prison, those little plastic cubes we saw Kiera being dragged to at the beginning of the second season. And that's where she is now, along with Liber8, Kellog, Jason, and even the body of Jaworski. Would this be "the cage" that Jason mentioned in the last episode? Man, do those cells look uncomfortable. One of the plot pieces they've explored in the last few episodes is the similarity between Kiera and Travis, made even more so by his acquisition of a supersuit. So let's have a very Matrix-like confrontation in the Piron lobby, why don't we? Travis dropped his trench coat; Kiera dropped her trench coat. The two of them shot at each other, which was sort of pointless since they're both bulletproof, so they utterly destroyed the lobby. And then they played a deadly game of tag in the elevator. By the time Kiera was tramping on Travis and he fell down the elevator shaft, Dan and I were both saying in unison, "I... have had... enough... of YOU!" Carlos is a heck of a guy, loyal, brave and true. And yet it still surprised me when he knocked out Dillon and threw away his career and quite probably his freedom to help Kiera get away. (I kept thinking of the contrast between what Carlos did for Kiera, and what her husband Greg did in the flashforward. Quite a difference there.) Carlos figuring out that Betty was the mole and the two of them going to Ann and Julian was also a surprise, although it probably shouldn't have been. We've known all along that Carlos is just not ready to be a brownshirt for the future City Protective Services. And according to a glimpse of Dillon's new police manual, the future CPS is pretty much now. 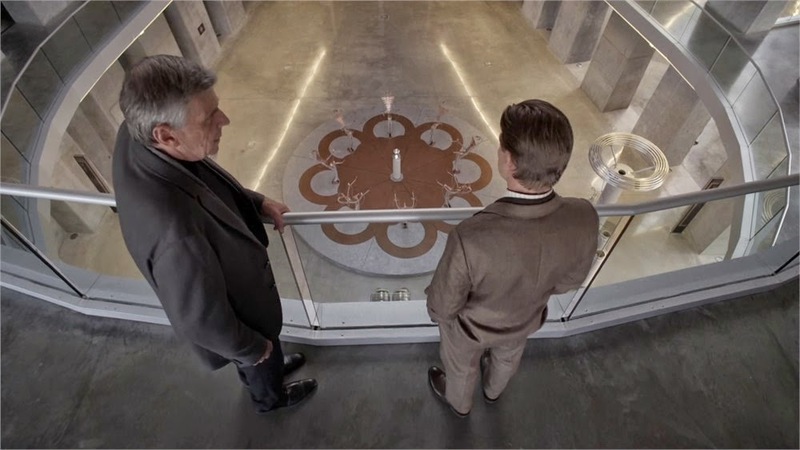 -- The execution chamber's copper circle things were very cool-looking. They remind me of a Star Trek transporter pad. -- Alec said angrily to Kiera that he would always blame her, and then he secretly winked at her. It was so like Oz in the Buffy episode, 'The Wish'. Very cute. Alec is very Oz-like. -- I thought Carlos might have been shot on the rooftop in the previous episode. Guess not. -- The minion with the glasses overheard the words "time travel", but got shot in the eye by Freelancers before he could react to that information. -- Since I've already completed reviews for the entire third season, this is my last Continuum review until season four debuts this summer. Kiera: "You shouldn't have done that." Carlos: "Yeah, there's an epidemic of that going around lately." Elder Alec: "People believe that they are free, but the reality is they've never been more enslaved." Younger Jason: "So you intend to rewrite history using these convicts?" Elder Alec: "Liber8 wouldn't exist if it weren't for me. Perhaps they're nothing more than a manifestation of my conscience." Travis: (to Kiera) "When are you going to wake up? You're the villain in this tale." Escher: "Time travel isn't just some technological marvel, Kiera. It's the family business." Terrific season finale and the best episode of the series so far. I’d say best episode ever, but season three offers some contenders. In any case, those final ten minutes are the best sci-fi drama this show has produced, giving us full disclosure on how Kiera’s time travel came to be while delivering another time travel with a betrayal-soaked twist. I must have watched those scenes fifteen times already. Let’s talk about Alec. There are great parallels between Alec and Elder Alec. Elder Alec is extremely manipulative (he is the Big Brother of this tale, after all), erasing Kiera’s mind to make sure his plan will follow without inconveniences and freaking getting rid of her by sending her back in time. He can say whatever he wants about his consciousness, but his actions show he isn’t anywhere near ready to give up the power he has (which makes me question how genuine is his desire to change the past for a better future). Present time Alec is as manipulative as his grown up self. I had no idea what he was up to. When he started lashing out at Kiera, I was pretty sure it was an act (his great wink confirmed), but, boy, he just used Kiera to get what he wanted. While I totally understand where he was coming from, that was a big betrayal. Can Kiera ever forgive him? Poor Kiera, she tried so hard. Sure she is narrow minded when it comes to politics, but at heart she is a good person and a good mom who just wants to come back to her kid. I’m sure that if she managed to come back to 2077, she would compare that world to the world she met in 2012 and would eventually lead the revolution against Elder Alec herself (sometimes I think that’s how the series will end). For now, though, one has to wonder how much longer she’ll take to wake up. Travis is right, in many ways she’s the villain of this tale. Even though she was betrayed by Alec, Kiera got a great demonstration of loyalty from Carlos. He sacrificed his career for her, and even if he didn’t approve the way Dillon was running things, you could still see how much it took for him to throw his career away for Kiera and then join Julian’s movement. I loved his line to Kiera about checking out on the future how he got out of that mess. Sadly, Carlos, Kiera will never be able to. Finally, all the twists related to the Freelancers were great! So they are trying to protect the timeline, not change it. I think Jason said that on an earlier episode. Jason knows it all, we just don’t give him enough attention. Now all the time travelers are either dead or locked on those tiny cages. That was a dark, claustrophobic, wonderful final shot for this season. - We finally found out what happened to Garza. I missed you, Garza. - Kiera vs. Travis fight was great, but at this point I’m a little tired of Travis as an antagonist. He is too much muscle power, very little brain. - I’m a little more forgiving of Kiera’s husband than you, Billie. While he didn’t tell Kiera that her mind had been wiped, he did what he could to make sure she would be out of harm’s way. Maybe he thought she would be safer not knowing what happened? - It didn’t hit me before the reveal that Jason was Alec’s son, but that was such a cool “of course” reveal. Well played, show. - Was Jason supposed to go back in time too? I had the impression he went by accident, but there’s been a while I’ve watched this episode and I don’t remember if Jason and Elder Alec’s conversations indicate if Jason time travelling was part of the plan. - I love the slow burn storytelling style of this series, how things grow nicely until they blow up on the season finale. The writers are not going for “this is a big, amazing story” feel all the time, they just deliver good stories and that’s it. I really appreciate that. I don't watch Continuum yet (it's on my list, I promise!)... 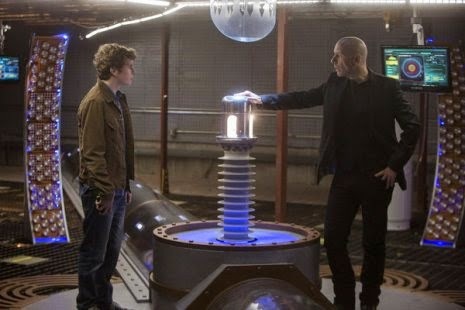 but I have to say when I saw the picture, my first thought was "Why is the TARDIS in Continuum?" Lamounier wrote, "Was Jason supposed to go back in time too? I had the impression he went by accident, but there’s been a while I’ve watched this episode and I don’t remember if Jason and Elder Alec’s conversations indicate if Jason time travelling was part of the plan." Yes, the Elder Alec told Jason that Jason was the only one he trusted to handle the Freelancer problem. Jason was supposed to go back. Nonei, what a terrific observation! I wonder if the producers did that deliberately? I bet they did.